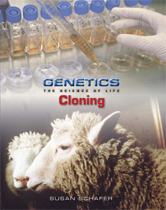 Chock-full of information, this titles provide in-depth explorations of the topics covered with fascinating examples of genetic cloning. CHAPTER 1 Can't You Just Send My Clone to School? CHAPTER 4 Is It Right? CHAPTER 5 What Does the Future Hold?